After 8 months and an estimated 15’000km, we finally rode into our temporary home of Phong Nha, Vietnam. This marks the official end of our epic Southeast Asia motorbike adventure. So many good times and memories (and more than a few close-calls along the way). Check out the highlights from our first 6 months of backpacking in Southeast Asia. Well it’s hard to believe, but an entire year has passed since we left Australia on our overland journey from Thailand to South Africa without flying. Of course a lot has happened during this year, and first of all we want to thank you all for following along on our journey! Since our last update from when we hit the 6 month mark of our backpacking mission, we have taken our motorbikes all over Cambodia and Vietnam, exploring far-flung places that few travellers ever get to see. From the islands of Cambodia to Long Cu, Vietnam’s northern-most point, we have seen a lot. Jazza ended up breaking our “no flying” rule, but I’m sure you will understand why. After winning the World Nomads Travel Writing Scholarship he got sent to Europe for 3 weeks to do a writing course with a Lonely Planet author. A real career-changer for us, and he flew out of and into from Phnom Penh. Not gaining any ground, we could overlook this breach. As 2014 drew closer to an end, we needed somewhere to settle down and get on top of some projects we have. We ended up choosing our favourite place, Phong Nha. After already a month here, we believe it was the right choice. Our NOMADasaurus brand has been taking off, and our following has grown substantially. Just the other day we were featured on Forbes about our journey. We have to thank you, our readers, for joining us along on our crazy adventure! Here is a collection of photos from our 1 year travelling highlights. There were a lot more we could have added to the list, but we will try to keep it as short as possible. Hope you enjoy them! 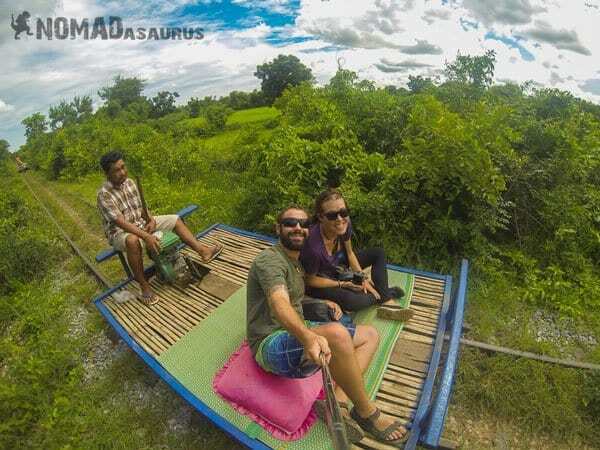 After hearing so much about it, we finally got to take a ride on the Bamboo Train in Battambang. Fast, rough, and at times treacherous, it was even better than we could have imagined! The beaches of Koh Rong were absolutely amazing. Such a wicked place to hang out for a few days, or a few months! Watching the sunrise over Angkor Wat. If that isn’t a bucket list experience, then we don’t know what is! In the middle of our trip something happened which would change everything – Jazza took a flight! I know, I know, but before you jump down our throats saying how we cheated, we believe this was for a good reason! Jazza was awarded the World Nomads Travel Writing Scholarship and got sent to Europe. After completing a writing course with a Lonely Planet author, he then road tripped around 4 countries over 3 weeks. Here Jazza is at Cabo Da Roca – The Western most point of the European mainland. A moment that will always be cherished! Fatigue is a major issue when you are riding motorbikes. This picture represents not just one highlight, but hundreds when we would pull over for some respite from the roads and managed to have a great experience in tiny towns. Here Lesh buys a fresh coconut for 50c. We decided to try our luck at crossing at a little-known border point between Cambodia and Vietnam. We rode 160km to investigate whether or not we could enter with our bikes. When we got there, the place was empty and there was only a piece of bamboo stopping us from crossing into Vietnam. Turns out you it is a local’s-only border. Oh well, at least the ride there was beautiful! But when we found the right border crossing, we couldn’t be happier! A last minute decision meant that we chose not to return to Thailand, and instead move back into Vietnam. In hindsight, it was one of the best spontaneous decisions we have ever made! The sand dunes in Mui Ne were like being dropped out in the Sahara Desert. Another last-minute-decision to head south instead of north, and we were glad that we did. After leaving Jungle Beach, just north of Nha Trang, we took some back roads to get to Hoi An. We ended up going 5 days without seeing another Westerner and rode along some of the most remote roads we have ever been on. Here Jazza stops in front of a large waterfall on the side of the road near Nam Tra My. At this point we were convinced that we would avoid major highways at all costs. It was a wise decision. The sunsets over the ancient city of Hoi An. This place really stole our heart and has become one of our favourite places in Southeast Asia. Everyone had told us to skip Da Nang. For this very reason, we didn’t. And what a great choice that was! Da Nang was truly surprising with just how captivating it is. This photo was taken from the top of the Marble Mountains. A beautiful shot of a beautiful place. The Hai Van Pass was made famous by the guys from Top Gear…Apparently. We wouldn’t know because we have never seen that episode. Still we took the Hai Van Pass, and yes, it is amazing! One town that had always been on our radar was Phong Nha. We had met so many backpackers who had named the caves the highlight of their trip, so we set aside a week to hang out there. The limestone caverns below the surface were absolutely amazing. This shot is from Paradise Cave. We left Phong Nha knowing that we would return one day. What we didn’t expect was that one day would come sooner rather than later…. We didn’t get enough of the caves in Phong Nha, so we headed to the Tu Lan cave system for a 2 day, 1 night jungle expedition. Bush bashing our way through the forest and exploring 4 different caves was one of the coolest things we have done so far! As is almost always the way when you travel, it is the people that make the experiences truly memorable. After spending 3 nights hanging out with the porters from Tan Hoa village we formed an amazing connection with them all. Their generosity truly touched our hearts. Drinking bottles of rice wine and beer at 6am, eating delicious jungle food, laughing at jokes that none of us could understand, it all ended up with us falling in love with these guys! It was meeting this young porters that officially made us declare Vietnam as our “favourite country”. Climbing the mountains of Ninh Binh was another great moment. The jagged limestone made for an interesting challenge, but the views were world class! The great team at Hanoi Backpacker’s sent us to Mai Chau to check out their amazing 3 day tour. This rural paradise is a world away from the hectic traffic of Hanoi. One thing that Lesh and I love is going to music festivals. When we found out that there was a 3 day, 2 night electronic music, arts and camping festival, we had to go! Next time you head to Vietnam, try and time it with the pumping Quest Festival! The views on the ride to Sapa were…well…awesome! Beehive-like karst mountains in the Dong Van Global Geopark. When people told us Northern Vietnam held the most sensational scenery, they weren’t lying! Us riding through Ma Pi Leng – Southeast Asia’a deepest canyon. One of the coolest things about riding motorbikes is being exposed to the elements. This means you are open to having kids run out, wave hello and give you high 5s at a moments notice! And that’s what happened – almost every single day for 8 months! The time Lesh got a kiss from the bride’s father at a Vietnamese wedding! Us standing at the observation tower in Long Cu. This is the Northern most point of Vietnam. Behind us in China. In 2015 we will finally cross the border and leave Southeast Asia, ready for the next leg of our adventure. We have some MASSIVE plans for 2015. In March we will cross into China, and then zig-zag our way around the country. Some of the tentative destinations are Hong Kong, Macau, South Korea and Japan. Then once we cross China it is time for Central Asia! Kazakhstan, Kyrgyzstan, Tajikistan, Afghanistan, Uzbekistan, Turkmenistan, Iraqi Kurdistan, Iran and into Turkey. That should just about take us into 2016, we think. Of course everything is subject to change and we can’t wait to see where we end up. Thanks for following, and we hope you awesome people continue to join us with our adventure! Happy Travels! What a magnificent year. You’ve done so much more in one year than we’ve probably done in two and a half, but as I always say; “travel is not a race”. I love how you both get so immersed in local culture and the countryside whilst you travel and always look forward to seeing which route you’ve taken since the last time I popped by your blog. Keep it up guys. Don’t stop. Travel is definitely not a race mate, and you and Franca have done a fair bit yourselves! Thanks so much for the kind words. Appreciate your support! Happy travels mate. Stumbled on your blog by accident, and got stuck here for a bit ) You guys are doing an awesome job covering SouthEast Asia. Looking forward to your reports from Central Asia – that’s definitely on our list of must see SOON! Thanks very much Jenia. We sure are trying our best! Central Asia will be a blast, that’s for sure! Thanks for reading and happy travels. This is awesome. All of the photos from Vietnam have been amazing! I really need to back and rent a bike and explore that way. Looking forward to following your travels through 2015! Thanks very much Dave. Vietnam is a beautiful country (our favourite), and very enjoyable to photograph. Happy travels buddy! Loving the adventures! Phong Nha was a firm favourite of ours in 2012. We are back to Vietnam this year for a fifth visit, it being our favourite place as well. Thank you for the great writing, it is a great tonic on cold winter days. Wow, you should return to Phong Nha now and see how much it has changed. Appreciate you stopping by for a read, Jo. Happy travels for your 5th adventure here! That is definitely an epic adventure! Amazing what you have done in one year, and how you succeeded to go Off The Beaten Track in countries where you also have mass tourism. I am now really impatient to read your Chinese adventures, and of course Central Asia, which I still have to discover completely! Have a great and safe trip in 2015! Thanks very much Gilles. Getting off the beaten track gets easier and easier the more you do it. It was great to meet you in Phong Nha this year, and I’m looking forward to the day our paths cross again. Happy travels mate!